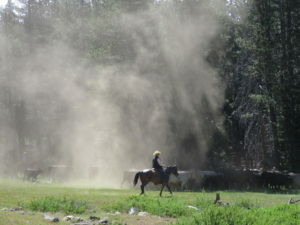 Grazing cattle in the high country is a subject of controversy. Historic traditions and public use of forest resources is must be balanced with water quality, meadow impacts, and the ringing of cowbells. A grant from California Humanities allowed historian Judith Marvin and Julia Costello to research this topic and this exhibit –and a forthcoming short film — are results of their study. 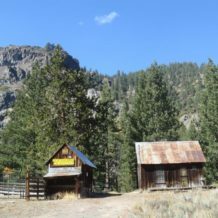 With help from the US Forest Service, Central Sierra Environmental Resource Center, and the Rasmussen, Dell’Orto, and Whittle ranching families, both history and modern practices are addressed. Descriptive panels with text and photos are displayed within a reconstructed ca. 1911 cow-camp tent outfitted with period gear. All are welcome to the reception. The exhibit can also be viewed during regular museum hours: Friday – Sunday 12-4 PM.